For the past few years there has been one week in May that you would find me in front of the TV watching all that the RHS Chelsea Flower Show had to offer and this year was no different. I have always wanted to go but had never managed to get tickets (I always left it way too late and by which point they had all sold out) and this year that did change. My Mum managed to get tickets for the both of us for the Friday and I couldn't wait. I made sure to tune in to the BBC last week in the lead up to us going. I wanted to see what was on offer this year and make a mental note of what I didn't want to miss. Come Friday morning I was so excited. I was finally getting to visit somewhere I had wanted to go for years. The heavens had opened though, it literally rained all day and it was so cold, it honestly felt like winter, but we didn't let that bother us, we still made sure we had a great day. As we entered the gates of the Royal Hospital the fragrant smell of flowers hit you, it was gorgeous. I made a point of inhaling that smell, it really was beautiful. Looking around us we really didn't know where to begin. It was nothing like I ever expected. There were so many companies there with stalls selling things, I don't know why but I had never imagined there would be anything like that there, I had always thought it would just be flowers and gardens, but it really was so much more. We started off looking at the Artisan gardens. They were so much smaller than I ever imagined, it's amazing how big they come across on TV, they literally were tiny. My favourite was probably the NSPCC, What Will You Leave garden. I also loved the Cath Kidston shed, the lawnmower outside was gorgeous. I was a bit gutted that the paint on the grass had been washed away by the rain. After the Artisan gardens we moved onto the Main Pavilion. It was filled with every flower imaginable. The displays were incredible. So much time and effort had been put in to it all and every small little detail had been thought of. I came away from the Pavilion with so much inspiration and so many ideas floating around in my mind. There are loads of things I would like to try out in my own garden at home. We moved onto the main show gardens next. I not a huge fan on the modern designs, the more traditional gardens were more my kind of thing. My favourite of these had to be the Arthritis Garden. I'm not usually a fan of sculptures in a garden but the designer really captured the feelings in his sculptures, I loved them. 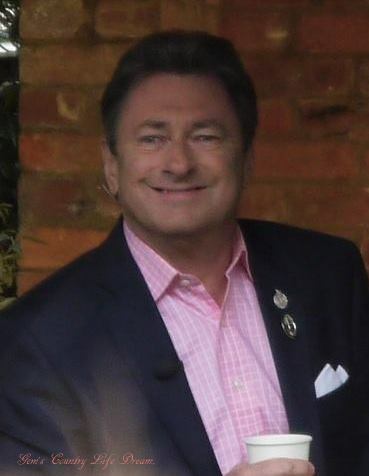 I also really liked the Homebase garden, and the Centenary garden, this particular garden came with the added bonus of Alan Titchmarsh being in it filming for the BBC, who bless his heart, posed for a photo. It really was an incredible day, one I won't be forgetting for some time that is for sure. I'm so glad I had the opportunity to go and will definitely try and get tickets to go again. We didn't get to see everything. Our ticket only allowed us entry from 3:30 which personally worked out quite well as a lot of the people that had the all day ticket had started to leave as we were arriving, I'm pretty sure the rain would have had something to do with that (but it worked in our favour so I wasn't going to complain) perhaps next time I would look at getting the full day ticket too just to have more time to wander round, but for a first visit, it was brilliant. Oh yes. I can see why you have wanted to go for years! My best friend's mother flies to the UK every year to see the show. My friend has no desire to see the gardens so maybe one year I will join her mother and fly over for the flowers!